Blasting off in a new direction for a new generation. 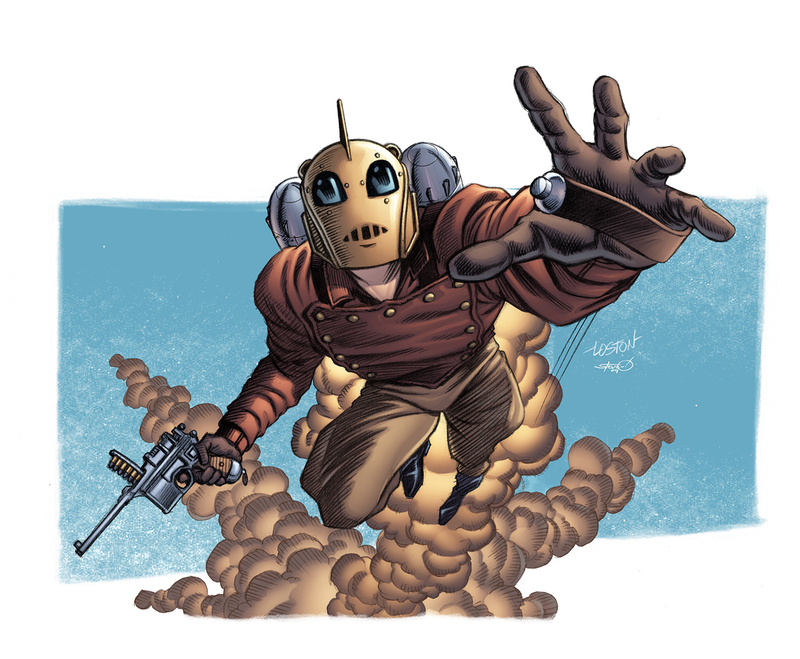 In 1991, Disney briefly revived the look and feel of the Golden Age of cinema to launch a new superhero, The Rocketeer. The intrepid hero, played by Billy Campbell, strapped on a jetpack to stop the nefarious misdeeds of a former spy working for the Nazis. Now, 25 years later, Walt Disney Studios has decided to reboot the cult-classic film with some major 21st century updates. Up-and-comers Max Winkler and Matt Spicer have been tapped to develop a script — tentatively titled The Rocketeers — that is both a reboot and a sequel to the original adventure. This time around, however, the film will be anchored by a black woman. When The Rocketeer debuted in ’91, it was a total dud. It pulled in a domestic gross just shy of $50 million and failed to impress both audiences and critics. In the happy snark of the early nineties, The Rocketeer’s earnest delivery and unabashed love of 1940’s serials failed to resound with potential fans — at first. The movie sprung from a series of independent comic books from Dan Stephens, but director Joe Johnston’s film soon surpassed the source material and developed a cult following all its own. According to The Hollywood Reporter, a 20th anniversary screening held in Hollywood saw fans lining up for blocks in the hopes of getting a ticket. The Rocketeer also has some real appeal to international audiences, which movie studios are increasingly trying to court. The story hinges on a straightforward plot with an unironic, wholesome hero and features broad humor and easily accessible action. While that may sound cookie-cutter to film snobs, market research has shown that moviegoers in China put out the most cash for films along those lines. The Chinese market is huge, and most major Hollywood production companies are trying to court its viewers. Given the inherently unobjectionable and apolitical nature of the work (because how controversial is it to say you hate Nazis? ), there’s little reason for the newest film shouldn’t outshine the original at the box office. Max Winkler and Matt Spicer, a relatively unknown duo, are writing The Rocketeers. While the duo probably haven’t produced anything you’ve seen yet, they do have two films on the horizon that just might make them household names. The first is Flower, an indie film directed by Winkler starring Adam Scott and Kathryn Hahn. The flick follows a sexually curious teen who develops a friendship with her mentally unstable brother. If that sounds a little emotionally complex for The Rocketeer, then the team’s other project, Magic Camp, should give you a better idea of what they can do. Based on a story from Steve Martin, the Disney-produced comedy follows an aging banker who returns to the summer camp of his youth in order to win the magic prize that he failed to nab as a kid. There’s still a lot of ground to cover before The Rocketeers hits theaters (hell, there’s not even a director attached). But the possibilities of a revamped look at the hero are exciting. It would be a mistake, however, for the producers to try and “cool up” the Rocketeer (or any new additions to the cast). The franchise itself is based on the classic archetype of a hero, not any of the new-wave antihero business that’s taken over comic book movies. Was the original super plausible? Of course not. That’s what made the film so accessible, though: it’s a straightforward battle between good and evil with some corny jokes and Alan Arkin thrown in for good measure. Putting a new face behind the mask is exciting, but it shouldn’t change the core formula.